Blogging Beautifully: Laundry Label Confusion! Ever had a disaster when washing clothes? I have. It wasn't one of my most epic moments. I've no idea what happened and I probably should have been more aware and maybe rechecked the washing instructions......... but I managed to shrink one of my daughters lovely woollen dungarees, she'd worn then only once and they were filthy so I bunged them in the wash and I'm sure you can guess what happened next.....they looked small enough to fit a Barbie doll. Did you know that alot of people find laundry labels confusing or misunderstand the instructions. 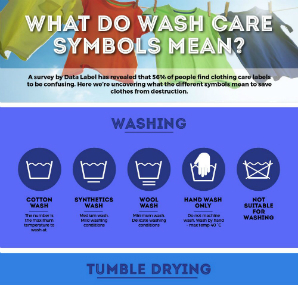 According to this recent survey from Laundry & Cleaning News over half of people find these labels confusing. The survey reports that over 56% of people don't always understand the washing instructions in clothes thus leading to damaged clothes which are then not wearable. Data Label who carried out the research have now designed a really handy guide to the most common care symbols. With that being said here are some tips to help when doing the laundry! Well I guess it goes without saying, check the laundry labels and check them again before putting the washing on! Separate your colours, seems obvious but it's definitely worth going through and making some nice colour coordinated piles ready to clean. If you have children that attend school or nursery then label your clothes!! We use some pretty cool adhesive name labels that can be washed but there are other varieties around so see which ones you prefer. When it's sunny hang them out to dry, not only does this save on a dryer but there is nothing nicer than getting the fresh air into washed clothes. Also the sun is great for bleaching your whites! These are just a few tips but I'm sure that there are many more. What tips have you got when doing the washing? * Information from a press release by Data Label. Sports Tours with Absolute Sports Travel! Where for Art Thou Motivation?? Tips for Choosing the Right Blind. Switch Up with Nintendo Switch!